We are learning more and more about the bacteria in our gut and the role is has on our body. There are books on the brain/gut connection as well as frequent advertisements for Activia on TV. Even at my annual physical the only advice from my doctor was to increase my intake of probiotics. Her suggestion was to get a supplement, but I was determined to help my guy bacteria by way of food. I’m constantly telling clients how we can get everything from food (there are some exceptions such as deficiencies) so I started changing my own diet. I invested in plain Kefir, which is a fermented drink that is similar to yogurt. The biggest difference is the amount of live cultures, aka bacteria. A typical yogurt has one to four strains while kefir has 12-24, depending on the brand. Each strain has its own purpose and function so getting that variety is important. Since the key to getting bacteria is the fermentation process, I’ve also been sampling in the making of kimchi. While sauerkraut is probably the most well-known fermented vegetable, kimchi is making its own space on the stage. It is cabbage in a spicy mixture and is commonly found in Korean dishes. It has an acidic bite, but the spiciness is usually the taste that is overpowering. The fermentation process is fairly easy and includes leaving the mixture on the counter for 2-4 days before enjoying it. 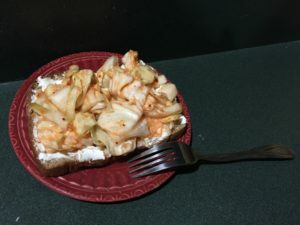 While I haven’t taken the normal route for eating kimchi, I have been eating it for breakfast on a piece of toast with cream cheese. I also took a stab at fermented beets, which are harder to find a way to include on a daily basis although still good. They are much easier to make and don’t taste as acidic, but they aren’t quite the snack I want when I get home. I cubed them and I will likely try to dice or slice them next time to make them easier to go with other things. This experimenting has also led me to see if I wanted to jump onto the kombucha bandwagon. At every farmer’s market there is homemade kombucha and it’s becoming more and more common in the stores. The key to this beverage is making sure it is raw as the pasteurization process will kill the bacteria. I decided to try one that was ginger flavored and as I untwisted the top the carbon dioxide seeped out. I don’t like carbonation so I struggled through the drink, but it did give me the caffeine I needed to power me through my morning. For now, I think I’ll stick to the kimchi for breakfast and kefir as a snack to get my probiotics, but maybe I’ll see about adding miso or sourdough bread into the routine in the future. What’s your favorite way to get probiotics?